The NASFUND at Boroko in Port Moresby branch was officially opened today by Chairman Mr Hulala Tokome. Mr Tokome said the Board in representing member interests and has placed a greater emphasis on Member Services in 2017. 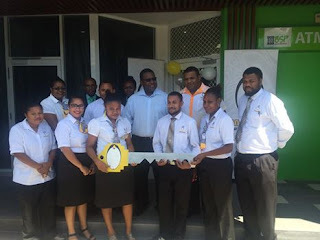 He said following the upgrade of Lae Branch to modern facilities with a 66 seat capacity, the management is pleased that the Boroko branch upgrade also creates better customer experience and convenience for members in Port Moresby. Meantime, Chief Executive Officer for NASFUND Ian Tarutia said this year’s aim is to give back to the active members who are contributing to the organisation. Mr Tarutia reminded members that NASFUND purposely is a retirement savings scheme for members to enjoy their savings after retiring from work.